... will be resumed as soon as Charlie has stopped emptying the contents of his stomach over me, his cot, the floor, his pushchair and anything else within a ten yard radius. He could do it for England at the moment. Honestly, I've never seen so much come out and at such high speed. And when he isn't vomiting he's sleeping. And if not sleeping, sitting on my knee and staring at the TV. Oh yes, he's ill all right - he's sitting still! Oh, poor baby! Poor you! A perfect way to spend the bank holiday, eh? Take care, you guys. So sorry! Hope he will be better soon. Maybe it's just a one-day-bug. I had it last week and was awful, but I was ok next day. Hope you'll manage to have a nice Bank Holiday weekend anyway. Ciao. A. Best wishes, I hope he gets better soon. Hope he is better soon, and the projecting stops immediately. Poor little chap. Hope he hasn't got what I've had this week ... if he has, then in approximately 48 hrs time, you'll be worrying about the other end. If you know what I mean. Hope he gets well soon - I'm 5 days in and still feel crubbish. Hope Charlie is better and that he hasn't passed his germs onto the rest of you! I can sympathize, as I'm in bed with a stomache bug myself. Fortunately for me, my stomache's more mature than little Charlie's, so I've managed to keep everything down so far. It's been a great excuse for me to read all of Writing Therapy, however. Kudos to you. It's a great read and an entertaining writing manual. I'll definitely be recommending it to others! Oh my heavens! Sending you lots of get well wishes!!! Feel better soon! Thanks, Z&T. I hope it wasn't my book that gave you the stomach ache to begin with! Everyone's feeling much better now thanks, B&R. Although for a boy who normally bounces back up from any kind of illness in a few hours, this has been an epic! Blimey, took me back to being a nipper. Not the sick, the BBC! Lots of love for Charlie, hoping he's better by now. He is thanks, CJ. 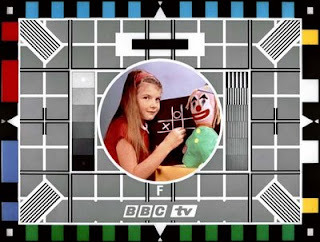 And oh... for the days of the test-card, eh?